He’s Black, He’s Beautiful, and by Gosh, He’s Angry: Race in the Early Doonesbury Strips, Part I. My last three “Long Strange Trip” posts have looked at how Doonesbury treated the Vietnam War during the first few years of its run, starting with B.D’s experience in ROTC through his decision to enlist and his encounter with Phred the Vietcong terrorist. Though B.D. was sent home as part of Richard Nixon’s policy of “Vietnamization,” his repatriation did not mark the end of GBT’s engagement with Vietnam. The war figured prominently in the strip up until the fall of Saigon in 1975, and in the years and decades that followed, the experiences of characters including B.D., Phred, and Kim Rosenthal allowed GBT to chronicle the lasting effects of an event that played a formative role for his generation. But I’m going to put Vietnam aside for a little while and go back to look at some other themes that figured prominently in Doonesbury’s first years. This, then, is the first of two posts about race in the early Doonesbury strips. I’ve said before that the character of Joanie Caucus introduced me to feminism in my early teenage years; in a similar vein, Doonesbury was my gateway to the concept of Black radicalism. As a kid growing up in the suburbs of Montreal in the 1980s, my education in terms of racism and the struggle against it was limited to a few clips from newsreels about Rosa Parks and Martin Luther King’s “I Have a Dream” speech. Garry Trudeau was the first writer to tell me about the Black Panthers and the idea that anti-racism did not begin and end with King. Inspired by some of the strips I’m looking at today, I wrote a Grade Eight term paper about the Panthers; I really wish I’d held on to it. I’m sure it would be massively embarrassing to read it now. Glickman shared Schulz’s reply with two African-American friends, Ken Kelly and Monica Gunning, who both wrote to Schulz to reassure him that a Black Peanuts character would be a positive step forward. A few months later, Franklin joined the Peanuts gang. Franklin would remain a secondary character in the strip, but including a Black character in a funny pages staple like Peanuts was, in 1968, a move that required moral courage: Schulz was asked by editors from Southern newspapers to stop producing material that featured integrated classrooms at a time when “forced integration” was taking place. Franklin’s first appearance. Peanuts, 31 July 1968. Schulz’s inclusion of Franklin was a radical political act, but Peanuts is not a political strip. Two and a half years after Franklin’s first appearance, Garry Trudeau began to address the politics of race in America in a manner that was informed less by a particularly narrow reading of King’s message – that fixing America’s race problems entailed incorporating African-Americans into the mainstream of American life – and more by both the harsh economic and social realities faced by Black people and by the work of radical Black intellectuals and activists who interrogated and ultimately sought to undo a system predicated on white supremacy. But while GBT brought something of the conditions endured by African-Americans and something of the Panthers’ ideas to the comics, he did not try to position himself as the voice of Black radicalism on the funny pages. Rather, Trudeau turned his satirical lens on his own cohort of white liberals and leftists, focusing on how white people who saw themselves as allies in the struggle for racial equality were often unable to deal with the Black struggle on its own terms. My next couple of posts will look at two African-American characters who appeared regularly in the first few years of Doonesbury: Calvin, a Panther who attends Walden College, and Rufus, a kid from the inner city whom Mike tutors. Calvin and Rufus play similar roles, drawing our attention to the insidious legal, social, and economic effects of white supremacy and pointing out the clumsiness, miscommunication and ignorance that often shapes the efforts of well-intentioned white people who join the struggle against racism. This post looks at Calvin’s appearances in the strip; we’ll look at Rufus next time. B.D. sticks his foot in his mouth. Doonesbury, 19 January 1971. Mark’s Dad makes no apologies for his racism. Doonesbury, 13 July 1971; 16 July 1971. Aside from allowing GBT to satirize the social racism expressed by B.D. and Mark’s father, Calvin’s presence also allowed him to write about how the American legal system used its power to silence radical Black political activism. Calvin’s appearances in Doonesbury coincided with the trial of the “New Haven Nine,” a group of Panthers who were accused of the murder of a suspected FBI mole. Activists at Yale held a large rally in support of the defendants; Yale President Kingman Brewster issued a statement in support of the protest. Somewhat frustratingly, Trudeau didn’t provide much of a back story for Calvin, but it’s clear that Calvin has engaged in the struggle in ways that put his freedom at risk, and that he has close contacts with people who have paid high prices for their activism. When Calvin unexpectedly faces an old comrade in an amateur boxing match, we learn that he’s tight with a Panther who, like Panther leader Eldridge Cleaver, had to flee to Algeria to escape legal persecution; as the two friends catch up, Calvin asks how Cleaver is doing. Comrades. Doonesbury, 14 May 1971. Mike’s offer to help Calvin during his trial not only reveals the racism permeating the legal system – the judge is depicted as a hooded Klansman – it also speaks to Trudeau’s larger critique of white allies to the Black cause. Mike is a college freshman, not an attorney, so it’s unclear what he might actually do to help Calvin beat the charges. But beyond naive overconfidence, the interactions that Mike and his friends share with Calvin reveal the multi-layered and sometimes contradictory ways in which white progressives engage with the Black liberation struggle. To Mike and his friends, Black radicalism is both glamourised and feared; while whites may enthusiastically respond to Black liberation rhetoric, they are less inclined to fully commit to a struggle that ultimately seeks to undo a system from which they benefit. Finally, their position in the racial hierarchy makes them unable to grasp the true meaning and stakes of Calvin’s struggle on its own terms. In Trudeau’s telling, whites from across the political spectrum ultimately use Black radicalism and Black radicals as means by which to ease their personal guilt about white supremacy. …well, he’s angry now. Doonesbury, 11 March 1971. The romanticization of the Black struggle among white progressives exists in tension with a limited commitment to the success of that struggle. Calvin’s association with the Panthers draws him rock-star levels of adulation. Students gush and cheer as their professor introduces Calvin as “a victim” who is Black, beautiful, and angry “… AN ACTUAL BLACK PANTHER.” Yet this white fascination with, and enthusiasm for, a man who is putting his freedom and possibly his life on the line for racial justice does not extend to accepting actual sacrifice in support of that cause. The white students at the rally in support of the accused Panthers might want to annihilate the status quo, but they don’t want to torch the frat houses. And while some whites enthusiastically embrace vision of Black liberation that won’t involve any real threat to their privilege, others, like Walden College’s President King (in imitation of his real-life counterpart Brewster), cynically sign on as a way to advance their own agenda. While President King/Kingman Brewster latches on to the cause to advance his own agenda, Walden/Yale students don’t want to take this revolution thing too far. Doonesbury, 20 March 1971; 17 March 1971. The possibility that the frats might get burned down speaks to another theme that Trudeau explores: white fear of Black violence. Even before we meet Calvin, Mike reveals himself as someone who sees radical ideas as leading to potentially bad outcomes for his personal well-being. While he doesn’t want to buy a newspaper from two campus radicals he bumps into – one African-American, the other white – because he “doesn’t believe in revolution,” he also doesn’t want draw the radicals’ ire for not supporting their “free breakfast program for little children,” GBT’s direct nod to the Black Panthers. And so “another white liberal bites the dust”: Mike purchases a paper, “buying in” to save his hide should the revolution actually materialize. The threat that Mike perceives is clearly evident in Trudeau’s rendering of the radicals’ glares and menacing smiles. The notion that Black radicalism ultimately represented a violent threat to white people drives a strip from a year later, when Calvin marks up Mike and B.D.’s door with an X, presumably as a target in an impending uprising, after they don’t come through with a donation for the Panther Defence Fund.In both strips, the characters’ fears of potentially becoming the victims of revolutionary violence is evident, and one can only wonder to what degree Mike’s wariness resonated with Trudeau’s readers. Mike buys in. 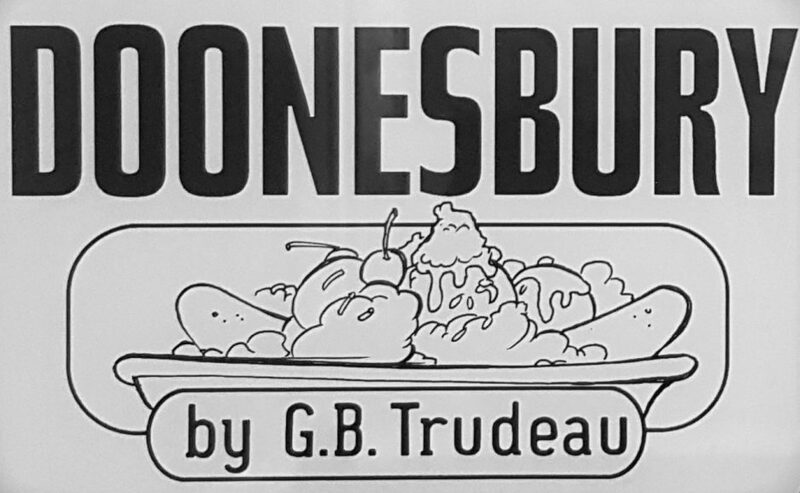 Doonesbury, 18 November 1971; 19 November 1971. Cluelessness abounds. Doonesbury, 22 March 1971; 19 March 1971. Because he has lived a life of privilege, Mike cannot understand the meaning and the stakes of Calvin’s political struggle. He means well, but there are intellectual and experiential barriers that prevent him from being able to support Calvin on Calvin’s terms. Next time, we’ll see how, even with his baggage of ignorance, awkwardness, and self-interest. Mike was able to foster a meaningful mentoring relationship with Rufus. There’s kind of a redemption story there: as we’ll see, Mike’s moments with his young student allowed GBT to give us a far more complex, and ultimately sympathetic view of his titular character. Mike will, eventually learn a bit. Really. Doonesbury, 26 October 1971. 1. For the trial, see Joshua Bloom and Waldo E. Martini, Black Against Empire: The History and Politics of the Black Panther Party, University of California Press, 2013, pp. 254-262. In fact, read the whole book, it’s an essential history of the movement. ‹ PreviousDoonesbury Goes to War, Part III: Phred.